. HOFMANN C, BUTTENSCHOEN K, STRAETER J, et al. Pre-clinical evaluation of the activity of irinotecan as a basis for regional chemotherapy[J]. 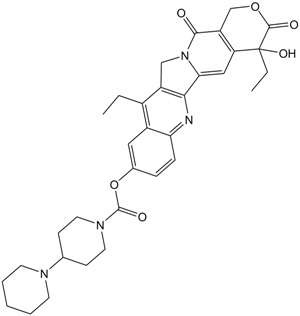 Anticancer research, 2005, 25(2A): 795-804.
. Ohdo S, Makinosumi T, Ishizaki T, et al. Cell cycle-dependent chronotoxicity of irinotecan hydrochloride in mice[J]. Journal of Pharmacology and Experimental Therapeutics, 1997, 283(3): 1383-1388.
. Tobin P, Clarke S, Seale J P, et al. The in vitro metabolism of irinotecan (CPT‐11) by carboxylesterase and β‐glucuronidase in human colorectal tumours[J]. British journal of clinical pharmacology, 2006, 62(1): 122-129.
. Shingyoji M, Takiguchi Y, Watanabe‐Uruma R, et al. In vitro conversion of irinotecan to SN‐38 in human plasma[J]. Cancer science, 2004, 95(6): 537-540.
. van Ark-Otte J, Kedde M A, Van Der Vijgh W J, et al. Determinants of CPT-11 and SN-38 activities in human lung cancer cells[J]. British journal of cancer, 1998, 77(12): 2171.
. Jansen W J M, Zwart B, Hulscher S T M, et al. CPT-11 in human colon-cancer cell lines and xenografts: characterization of cellular sensitivity determinants[J]. International journal of cancer, 1997, 70(3): 335-340.
. Na Y S, Jung K A, Kim S M, et al. The histone deacetylase inhibitor PXD101 increases the efficacy of irinotecan in in vitro and in vivo colon cancer models[J]. Cancer chemotherapy and pharmacology, 2011, 68(2): 389-398.